He is rather unassuming and speaks softly without carrying a big stick. Dutch foreign affairs minister Frans Timmermans, however, has put his small country back on the world map after his predecessors beat a retreat to behind the dikes and levees of narrow nationalism. While The Netherlands has historically punched above its apparent weight on the global stage, over the past decade the country veered away from long-standing internationalist policies to concentrate on furthering short-term national interests. Cooperation and consensus were replaced with obstruction and stubbornness. The change did not pay off. Within the European Union, Dutch representatives gained a reputation for blocking even meaningful initiatives – often out of ill-defined spite – and seeking confrontation over the most minute of legislative or procedural details. The EU mostly ignored the quarrelsome Dutch. The Netherlands also lost its observer status at G20 meetings, a loss particularly painful since the country’s GDP (nominal) – the 17th largest globally – would seem to warrant inclusion. Mr Timmermans has now reverted to a more pragmatic set of policies that aims to undo the damage wrought. In the aftermath of the air disaster with Malaysian Airlines Flight MH17, in which 194 Dutch lost their lives, Mr Timmermans managed to formulate a dignified response which culminated in an emotional yet well-balanced speech at the United Nations General Assembly in New York. The speech was watched over a million times on YouTube and drew wide applause from all corners. By claiming the moral high ground, Mr Timmermans was able to keep heads cool and obtain tangible results such as the return of the remains and the belongings of those who perished. In the process, he gave Dutch foreign policy a face of balance and reason. This newfound equilibrium should pay off handsomely in Europe where The Netherlands may now resume its natural role as a bridge between the all-powerful Berlin-Paris axis and the recalcitrant British who never seem to tire of kicking against the EU edifice. In The Hague, London may now again find a natural ally that tempers emotions and gets results. 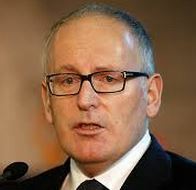 For all his modesty, Mr Timmermans has a commanding presence: He is fully fluent nine languages, is a classicist at heart, and knows European history inside out. He is a voice of reason in turbulent times when shouting seems the norm. A member of the Labour Party and a former career diplomat, Mr Timmermans is an expert on European integration. At the time the Treaty of Lisbon was being put together (2007), he successfully lobbied for a greater role of national parliaments in the European decision-making process. A firm believer in the concept of a united Europe, Mr Timmermans recognises the need for a more transparent and democratic European Union. He just doesn’t think this goal can be attained by hacking away at the EU’s foundations and proposes a slightly more constructive approach.